Hernias are one of the most common diseases. The frequency of multiple hernias is much higher than the frequency reported during herniorrhaphy. Multiple hernias may account for some of the so-called recurrences, in which the small hernia may be veiled by the bigger one and omitted. 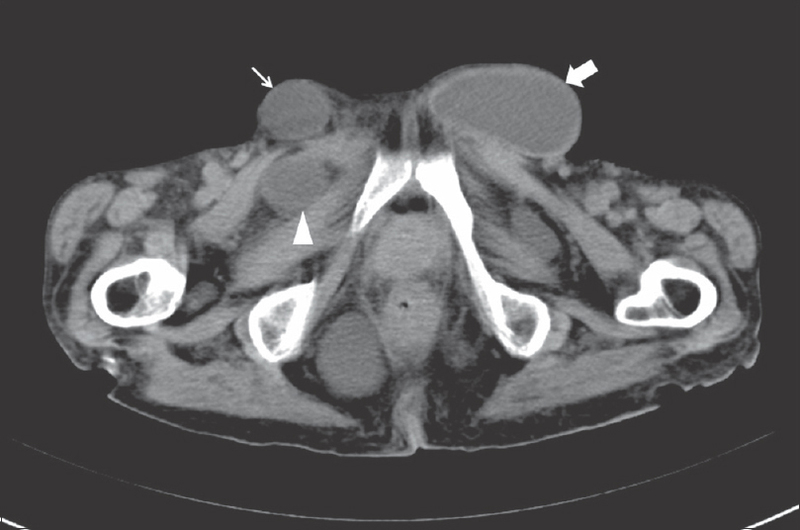 In this study, we present a case of an 83-year-old female who suffered from multiple hernias namely a left-sided indirect inguinal hernia, a right-sided femoral hernia, and a right-sided incarcerated obturator hernia. Additionally, the characteristics and treatment of obturator hernia were discussed. Ultrasound and computed tomography (CT) are capable of accurately diagnosing groin hernia. Preoperative bilateral ultrasound of examinations or abdominopelvic CT should be recommended to perform routinely for patients with suspected hernias to avoid ignoring the concurrent hernias. A careful exploration of the operative field in the operation is mandatory. The CT is also helpful for early diagnosis of obturator hernia. In addition, the intra-abdominal approach through a low midline incision might be a preference for the treatment of obturator hernia. Hernias are one of the most common diseases. Herniorrhaphies are now routinely performed with low morbidity, which are effective in symptoms control and prevention of incarceration or strangulation. It has been reported that more than 20 million inguinal herniorrhaphies are performed yearly around the world. However, hernia recurrence is still one of the most important adverse outcomes after herniorrhaphies, with 5-year reoperation risks ranked from 4.7% to 6.4% in Europe and the US., Risk factors for reoperation include surgical technique, and possible defects in collagen metabolism. Another important reason for reoperation is that multiple hernias, in which the small hernia may be veiled by the bigger one and omitted, may account for some of the so-called recurrences. In this study, we report a case of incidental synchronous multiple hernias of indirect inguinal hernia, femoral hernia, and incarcerated obturator hernia, extract some lessons we can learn from the case and review the literature. An 83-year-old woman presented with a 5-day history of abdominal pain, abdominal distention, vomiting, and a failure to pass flatus and feces. There was also a radiated pain to the medial lateral aspect of the right thigh. The patient had a history of severe pulmonary and heart disease, congenital heart failure (Heart function: grade IV), and chronic obstructive pulmonary disease with pulmonary failure. The patient had not been operated for inguinal hernia previously. Physical examination demonstrated a distended abdomen with mild abdominal tenderness and hyperactive bowel sounds. A lump (3 cm in diameter) was present in the inner side of right thigh, just below the inguinal ligament and a left inguinal bulge with diameter of 5 cm was also found, both of which were reducible. Computed tomography (CT) images of the abdomen revealed a left-sided indirect inguinal hernia, a right-sided femoral hernia, and obvious intestinal obstruction with a low-density mass located between obturator externus muscles and ipsilateral pectineus (right-sided obturator hernia) [Figure 1]. However, the patient refused operation and discharged from the hospital worring about the operative risks. The patient was admitted into another hospital at the same day. An explorative laparotomy through a low midline incision was performed immediately. The small bowel with the length of 3 cm was found to be necrotic when the incarcerated obturator hernia was released, bowel resection and anastomosis were performed. At the same time, hernia defect around obturator foramen was closed with interrupted non-absorbable sutures. The reducible indirect inguinal and femoral hernias were chosen to be treated when the patient recovers from this emergency condition. The patient suffered from the pulmonary infection and heart failure after the operation, but was cured by intensive care therapies and discharged finally. To our limited knowledge, this is the first report presenting a case with synchronous indirect inguinal hernia, femoral hernia, and incarcerated obturator hernia. We report this case because of the rarity of the condition. Therefore, the accumulation of more cases is important to better understand the characteristics and risks of this unusual condition. Being familiar with this condition may facilitate the patient's treatment and prevent the avoidable faults from surgery or other interventions, particularly in the emergency setting. Additionally, the CT image for the 3 kinds of hernias in the case is very typical, classical, and impressive. In addition, the treatment strategy for such unusual condition is challenging and need to be discussed deeply. Furthermore, we emphasized the roles of ultrasound and CT on the preoperative examinations in the text to avoid the ignorance of the concurrent hernias. Some lessons learnt from this case have been summarized under this context. Actually, the incidence of multiple hernias is not low, which is one of important reasons for reoperation and may account for some of the so-called recurrences. Ekberg et al. had performed herniography in 1010 patients with unclear groin pain and found seventy-one (23%) had multiple hernias including indirect, direct, femoral, and obturator types in total of 314 patients who had been diagnosed as having hernias. It is probably that some not-too-obvious hernia would be omitted when patients with multiple hernia were treated, which would cause the so-called recurrence or even some life-threatening complications of bowel obstruction or strangulation. It has generally been considered that there was a higher risk of hernia accident with increased age and an increased mortality rate associated with emergency hernia surgeries. Hence, it is necessary for us to perform some preoperative auxiliary examinations for hernia patients to diagnose accurately and avoid ignoring the concurrent hernias. If multiple hernias were not detected preoperatively, and only single hernia was evaluated intraoperatively, the concurrent hernias were probably easier to be skipped. The frequency of multiple hernias is much higher than the frequency reported during herniorrhaphy. Therefore, a careful exploration of the operative field in the operation is mandatory. Laparoscopic surgery might be useful in diagnoses and treatments of patients with multiple hernias. The history and clinical examination are usually required to confirm the diagnosis of hernia adequately. However, diagnostic imaging of ultrasound, CT, magnetic resonance imaging, or herniography are important in particular cases, including obese patients; small hernias not evident at the clinical examination; swellings of unclear origin; pain at the site of a hernia port without swelling, etc. Ultrasound is an accurate technique for the detection of inguinal and femoral hernias in patients. The sensitivity in finding a hernia of any kind by ultrasound was 92.7%–100%, while the specificity was 92%–100%. The sensitivity of ultrasound was even significantly higher than that of herniography. The advantage of CT for the diagnosis of clinically occult groin hernia was also proved with a positive predictive value of 92% and a negative predictive value of 96%. Compared with CT, it is reported that dynamic abdominal sonography examination that is more economical and could be performed on the bedside is an accurate alternative for diagnosing hernias without radiation exposure. Hence, we consider that preoperative bilateral ultrasound examinations should be recommended to perform routinely for patients with suspected hernias to avoid ignoring the concurrent hernias, especially in the aforementioned particular cases. Obturator hernia occurs when viscera herniates through the obturator canal, in which the obturator vessels and nerve might be compressed. Obturator hernias account for 0.07%–1% of all hernias and 0.2%–1.6% of all cases of mechanical obstruction of small bowel. The early diagnosis is challenging because the symptoms and signs are non-specific. The first clinical presentation driving the patients to hospitals usually is small bowel obstruction. The relative specific symptoms that are caused by compression of the obturator nerve include Howship-Romberg sign and Hannington-Kiff sign. Howship-Romberg's sign is defined as a radiated pain in the medial lateral of the lower limbs, while Hannington-Kiff sign is the absence of adductor reflex in the thigh. Some studies have reported that the Howship-Romberg sign could be seen in 37% to 60% of cases. In our case, patient had positive Howship Romberg's sign and small bowel obstruction. Early diagnosis is important since delay in detecting obturator hernia causes increased morbidity and poor prognosis in patients. It has been reported that the mortality was 12%–70% if obturator hernia with intestinal obstruction happened. Appropriate imaging examinations may be beneficial to early diagnosis and facilitate timely operations with improving clinical outcomes. Although several diagnostic imaging modalities including plain radiograph, ultrasonography, and abdominal CT could be used, abdominal CT is regarded as a standard diagnostic modality for obturator hernia, with superior sensitivity and accuracy. It has been reported that the accuracy exceeded 80% in diagnosing obturator hernia. Prompt abdominal CT scan may show herniated loops of small bowel protruding the obturator canal and locating between the pectineus and obturator muscles. The images of intestinal obstruction also can be revealed if hernia is incarcerated. Given that the poor pulmonary and cardiac functions of this patient, the most important is to manage the incarcerated obturator hernia in an emergency setting. The reducible indirect inguinal and femoral hernias could be treated under local anesthesia in selective tension-free herniorrhaphy operations. For this patient, the best operative approach would be to deal with the obstruction and hernia through a low midline incision. Various surgical approaches for obturator hernia, such as abdominal, inguinal, retropubic, obturator, and laparoscopic approaches had been described. However, the intra-abdominal approach through a low midline incision might be a preference as it can establish the diagnosis, avoid the obturator vessels, expose the obturator ring, and facilitate bowel resection. Treatment consists of reduction of hernia contents and simple closure of hernia defect with interrupted non-absorbable sutures or placement of a synthetic mesh. If strangulated intestine was found during the exploratory laparotomy, bowel resection should be performed. In conclusion, multiple hernias should be paid attention to. Preoperative bilateral ultrasound or CT examinations should be recommended to perform routinely for patients with suspected hernias to avoid ignoring the concurrent hernias. A careful exploration of the operative field in the operation is mandatory. The CT is also helpful for early diagnosis of obturator hernia. Additionally, the intra-abdominal approach through a low midline incision might be a preference for the treatment of obturator hernia. Fitzgibbons RJ Jr., Ramanan B, Arya S, Turner SA, Li X, Gibbs JO, et al. Long-term results of a randomized controlled trial of a nonoperative strategy (watchful waiting) for men with minimally symptomatic inguinal hernias. Ann Surg 2013;258:508-15. Eklund AS, Montgomery AK, Rasmussen IC, Sandbue RP, Bergkvist LA, Rudberg CR, et al. Low recurrence rate after laparoscopic (TEP) and open (Lichtenstein) inguinal hernia repair: A randomized, multicenter trial with 5-year follow-up. Ann Surg 2009;249:33-8. Kouhia ST, Huttunen R, Silvasti SO, Heiskanen JT, Ahtola H, Uotila-Nieminen M, et al. Lichtenstein hernioplasty versus totally extraperitoneal laparoscopic hernioplasty in treatment of recurrent inguinal hernia – A prospective randomized trial. Ann Surg 2009;249:384-7. Ekberg O, Lasson A, Kesek P, van Westen D. Ipsilateral multiple groin hernias. Surgery 1994;115:557-62. Campanelli G, Pettinari D, Nicolosi FM, Cavalli M, Avesani EC. Inguinal hernia recurrence: Classification and approach. Hernia 2006;10:159-61. Robinson P, Hensor E, Lansdown MJ, Ambrose NS, Chapman AH. Inguinofemoral hernia: Accuracy of sonography in patients with indeterminate clinical features. AJR Am J Roentgenol 2006;187:1168-78. Garvey JF. Computed tomography scan diagnosis of occult groin hernia. Hernia 2012;16:307-14. Khaladkar SM, Kamal A, Garg S, Kamal V. Bilateral obturator hernia diagnosed by computed tomography: A case report with review of the literature. Radiol Res Pract 2014;2014:625873. Gupta R, Singh H, Kang M, Singh R. Strangulated obturator hernia. BMJ Case Rep 2014;2014. pii: bcr2014207071. Yokoyama Y, Yamaguchi A, Isogai M, Hori A, Kaneoka Y. Thirty-six cases of obturator hernia: Does computed tomography contribute to postoperative outcome? World J Surg 1999;23:214-6. Rodríguez-Hermosa JI, Codina-Cazador A, Maroto-Genover A, Puig-Alcántara J, Sirvent-Calvera JM, Garsot-Savall E, et al. Obturator hernia: Clinical analysis of 16 cases and algorithm for its diagnosis and treatment. Hernia 2008;12:289-97.